Fishing from natural resources is an ancient practice resembling the history of human beings. Particularly this scenario is very common in the rural areas during monsoon. When agricultural lands, road side canals, ditches, flood plains etc. 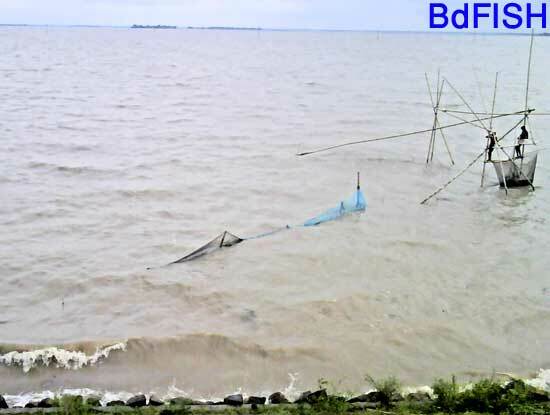 are flooded during the monsoon, fishing activity starts in an intensifying means. Although fishing technique began through using hands but with the change of time and evolutionary process, this technique is also changed. At present, fishermen harvest fishes from natural resources by using different gears. Though, fishing from natural resources is a profession for fishermen but many persons harvest fish during monsoon as a hobby. In this case, different gears are used for fishing among which Kholsun, Koi jal, Khepla jal, Thela jal, Khora jal, Hooks and lines are common. This gear is commonly used in all over the country. During the monsoon season, this gear is manufactured in family level. Fishermen throw this gear by hand from boat or bank to cover a circular area of water. The net quickly sink of the bottom and then is pulled up slowly to capture fish. Almost all species of fish can be caught by using this gear more or less round the year. This gear is very important for meeting the family and local fish demand. This net is triangular in structure. The longer portion of one of the poles is used as a handle. Thela jal is provided with fine mesh-sized mosquito net. This gear is usually used to harvest punti, tengra, shol, gojar, chingri etc. This gear is made off nylon or polyester fibers. Fishes like-koi, shinghi, magur etc. are harvested from the flooded rice fields or flood plains during monsoon in the rural areas. Use of this gear is remarkable both in commercial and non-commercial purposes of fish harvest. Participation of the young generations in case of using this gear is mostly notable. It is one of the mostly used fishing gears in flood plain during the rainy season. It is triangular shaped and it’s main structure is made of bamboo. A mosquito net is attached to its bamboo frame. Mainly different small indigenous species are harvested using this gear. Fishing rods is used to harvest small quantity of fishes. Fishing rods consist of a bamboo stick, twine, hooks and floats. Size of hooks depends upon fish species and type of water body. In most cases, all type of fishes can be harvested using fishing rods; shol, boal, taki, rui, catla, mrigal, koi, punti, tengra etc. mostly harvested. In addition to the above mentioned gears; kholsun, seine net, long line etc. 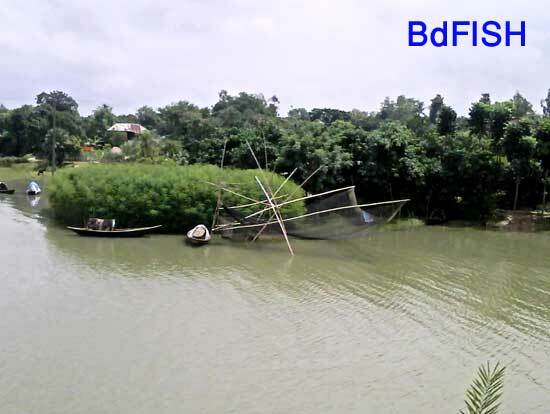 are also used for fishing in the rural areas of northern Bangladesh during monsoon. The next episode of this writing will be published on seine net, long line etc. Visited 3,560 times, 1 visits today | Have any fisheries relevant question? S/He published 17 features. View All.